Most of you would recognize that fuzzy face of one fire preventing bear. Smokey the Bear has captured the hearts and minds of the American public since he came onto the stage in 1944 – during World War II. He was a blend of advertisement genius and Forest Service policy, the story of a real black bear cub orphaned by a forest fire. Beyond the cute mascot lurked real fears of forest fires, especially since the Japanese attempted to light SW Oregon coastal forests on fire (read more about the Lookout Air Raids of 1942 and fire balloons launched into the jet stream between November 1944 and April 1945). Though the attitudes, policies, and messages about forest fire and wild land fire management has changed, Smokey continues to be the major symbol for the Forest Service. How about one funny looking owl name Woodsy who came onto the scene in 1971? 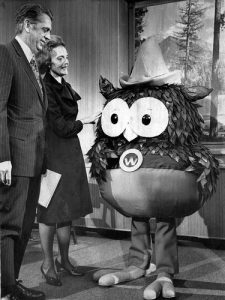 Mr. and Mrs. Clifford Hardin meet Woodsy Owl. Woosy is the newest environmental symbol of the United States. Woodsy was the new environmental symbol for the forest service, protection of wildlife, and promotion of wilderness appreciation. His motto “Give a hoot — don’t pollute!” was modified in 1997 to “Lend a hand — care for the land!” And yes, you can “like” Woodsy on Facebook and follow him on Twitter! Then there are those symbols that didn’t make it… Who remembers the “Keep Green” campaign that ran alongside Smokey? Yes, it was left by the wayside after the fears of World War II died down. Throughout the 1940s, various Keep Green programs proved to be incredibly successful in educating the public about the importance of forest fire prevention. They also provided an excellent foundation for the later success of the Forest Service’s Smokey Bear campaign. 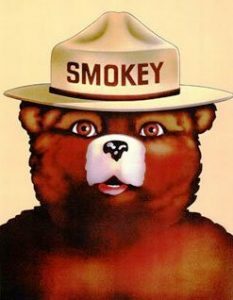 While the popularity of Smokey Bear as the dominant symbol of fire suppression caused the Keep Green campaigns to eventually fade to the background, these campaigns are still noteworthy for their incredible success. Images from the US Forest Service, Civilian Conservation Corps, and more can be found in the OSU’s digital collections and on Flickr Commons. Come take a look you never know what is going to make you think, smile, or just laugh out loud. Learn more about Smokey’s Journey and see some great posters! This entry was posted in Main Page on March 5, 2012 by edmunsot.